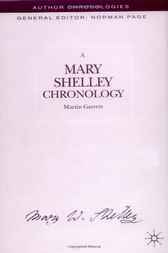 A Mary Shelley Chronology covers in detail the three main stages of her extraordinary life: her childhood as daughter of two of the best known radical writers of their age - Mary Wollstonecraft and William Godwin; the travels, losses, tensions and creative achievement of her time with Percy Bysshe Shelley from 1814 and her long widowhood from 1822 and her later works. This chronology follows all these experiences and activities, the genesis and publication history of her writings, her travels, friendships and intimate relationships with several other major figures of the Romantic period. MARTIN GARRETT has written on Romantic, Victorian and Renaissance literature. He has taught for various organizations, including several colleges of Oxford and Cambridge Universities.